New York, NY - Taglialatella Galleries is pleased to present “GAME ON! 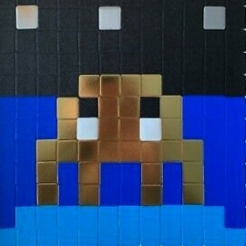 The Art of Invader”, an overview of limited edition prints and original works created over a decade by artist Invader. Invader, AKA Space Invader, travels from city-to-city “invading” the streets with mosaic images inspired by video games, movies, cartoons & comics, and other icons of pop culture. The famously masked artist, a self-described “UFA”, or Unidentified Free Artist, has spent the last decade on his Space Invader project, embarking on “missions” and creating what has become a world-wide presence of public graffiti rivaling that of contemporaries like Banksy, Shepard Fairey, and other leading members of the street art world. Invader has gone so far as to create maps for his followers looking to find works, as well as an application for smart phones encouraging his fans to play a game while on the hunt for his mosaics. Most recognize city streets as the artist’s primary means of displaying work, but Invader has released select limited edition prints on paper while also producing an “Alias” duplicate of every original mosaic; these are often sold to private collectors or reserved for museum exhibitions. The artist has also created “Rubik Cubism,” a subset to the mosaic medium, by grouping Rubik Cube puzzles together and manipulating the movable and colorful tiles of each cube to form images. GAME ON! The Art of Invader will feature the majority of the artist’s published prints, as well as original works from his studio, videos of his missions, and examples of his works from the street as a reference to his graffiti from successful invasions. The exhibition will be unveiled on May 11th, 2017 and is running concurrently with Invader’s HELLO MY GAME IS museum exhibition at the Musée en Herbe in Paris. In honor of the artist’s playful imagery, the mission of Taglialatella Galleries will be to present the art in fun-filled environment for all to enjoy. Invader has been quoted to state the “Game is not over!”, so we say GAME ON!